ha ha, this is funny. I always say that you never regret the thing you bring home only the one you don't. Junk remorse, I like that! Look forward to seeing what you do with the cart Liz. It's a cute cart but even the wheels are decorative against a fence or wall if you can't fix it. I vote to leave it as a cart! Maybe paint it so it shows up better? It would make a great "tea table" for outside. In fact, I could use it in my gazebo!!!????? 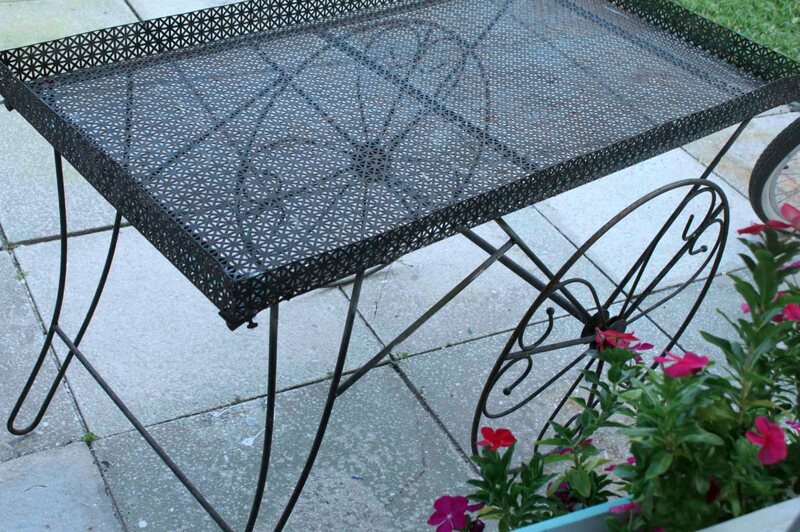 I'm torn - at first I'm thinking painting and use it outside as a bar cart (see that alot in blogland). But then I'm thinking - the wheels look great as accent pieces and I bet the top would be wonderful as a huge tray - put some handles on it and paint it an awesome colour. And you're right - never leave anything on the side of the road. My mother always used to say "don't look a gift horse in the mouth - you can always make glue from him later". Same rule applies to junk. Hmmm...as I'm looking for something relatively thin, ornamental, and unobtrusive to hang on the fire wall behind my wood burning stove...I'd have to go with break that baby down and use the wheels and punched metal as wall art! Cause...that's what I want. But...also being the own of a welder and married to a welder...I'd have to say. Fix it ~it's so cute! The barber chair? Why? why didn't you get it if you knew you'd been wanting one? It's family for crying outloud... they know how you are! Don't they? I so hate it when I pass something up and then regret it later. It is the worst feeling because you just know it won't be there when you go back. I have that exact cart on my back deck. I inserted a piece of plexi-glass in the tray (for easy cleaning)and use it as a beverage cart when entertaining. A huge hanging basket of flowers (without the hanger) occupies it the rest of the time. I kept mine black as it fits in with the rest of the uot door furniture. I vote to keep it as a cart!! What great finds! I can't believe someone just put an old barber shop chair out for the picking. I am sure you could have fixed it up BUT knowing you and your luck, another one will cross your path. Enjoy time with your family. I bet you will find another barbers chair in better shape at a better time for you too! Love the cart. I'm sure you'll figure a way to fix the wheel. It'll be great. 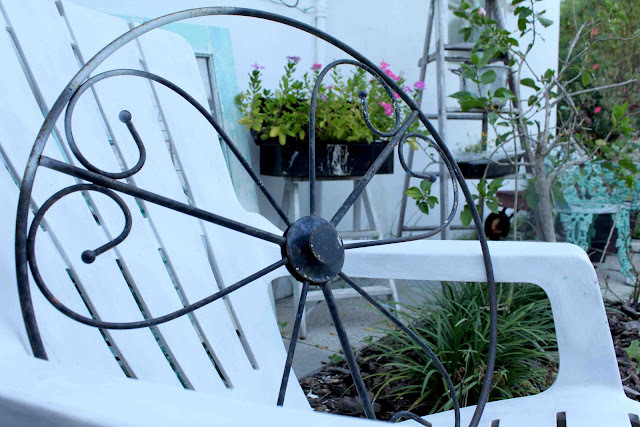 I love the wheel - what a perfect garden accessory!